W. H. Chong is an artist and a book designer. He is one of Australia’s foremost cover designers, winner of multiple awards, and is an inductee in the Book Designers Hall of Fame. How does a design happen? How does the raw manuscript travel through the many, many discussions in a publishing house before it shows up in a bookstore? Join W.H. Chong, one of Australia’s foremost cover designers for this practical and educational workshop. Are you a designer, writer, student, budding editor or just curious? Are you interested in the publishing industry or thinking of going down the self-publishing route? Learn how to tap into your creative self in this three-hour workshop with W.H. Chong, one of Australia’s most highly regarded book designers. W.H. Chong will take you on a journey through his own creative processes, leaving you with a newfound understanding of the industry, and fresh ideas with which to begin creating your own designs. Expect to leave the workshop empowered, enlightened and entertained. 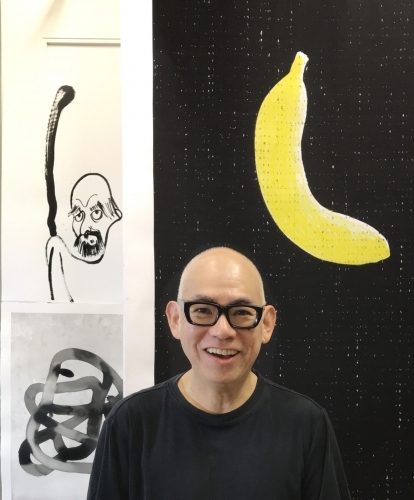 W. H. Chong is an artist and designer. He is one of Australia’s foremost cover designers, winner of multiple awards, and Design Director at Text Publishing. He was inducted into the Australian Book Designers Hall of Fame in 2013. Chong’s near life-size portrait of novelist Michelle de Kretser is in the collection of Canberra’s National Portrait Gallery. He has spoken about book design on radio and at literary festivals and written on art and culture for Crikey and Daily Review. He resides in Melbourne. Chong's exhibition Everything Changes is now showing at Lone Goat Gallery until June 13 2018.